I'm sitting here listening to my six-year old son and his friend have a play date. They put together a race track and dragged out all of Zack's many NASCAR Hot Wheels cars. I am now listening to them act as color announcers, using each car's sponsor as the cue for their announcement. "Also, this is brought to you by, CHEEZIT! Get your OWN darn box." "Yep! He's the last car up to the practice round. He's full of OLD SPICE." "And he's back. CHEEZIT is back from his stomach ache. He's feeling a lot better now. He got his own box. But he ate it all." When I would get a bit down or depressed, I would make up music videos in my head. Early on, when I was an adolescent, the daydreams involved me singing something to adoring fans or dancing something flawlessly (also to adoring fans -- do you see a pattern here?). Nowadays, I just direct cool visions of happiness to cheery music scores. So I was THRILLED to find this video via a blogger friend who graciously allowed me to pass it on to you. This clip, for the movie "500 Days of Summer", is exactly the sort of thing that goes on in my head when I'm blue and need to pull myself up by my own bootstraps. Welcome back! I hope you enjoyed Part One and are ready to enjoy the final part of our wedding story. In Part One, I left you with my waking to a beautiful autumn day - the perfect day for marrying a man I met ten years previously, and then lost total contact with. What a long, emotional journey we'd both traveled to get to the point where we serendipitously reconnected ... and how strange that I'd met the man I was destined to marry so long ago, but never knew it at the time! Our family and guests relaxed before the wedding at the country club, which helped calm the nerves and allowed everyone to catch up -- remember, pretty much everyone was coming in from out of town and some hadn't seen each other in years. 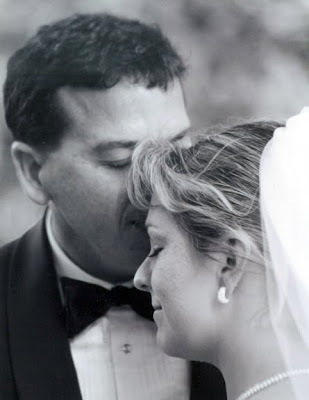 We broke with tradition when Rick and I decided to see each other for the first time before the ceremony. I think this was a grand idea because one or the other of us would likely have passed out in the church from giddiness or nervousness otherwise! It was beautiful. Our photographer, Ken Graham, was amazing. He set up the entire thing, setting me up in the center of one of the rooms, and then went to find Rick. I have no idea where Ken was after that, because time stopped. Time for the ceremony. 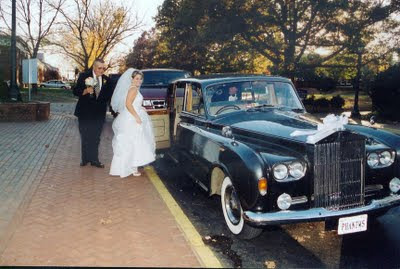 My maid of honor, bridesmaid, and I were driven to the chapel in a vintage Rolls Royce Phantom. That was an event! The UVA football game had just let out, and it was, apparently, a spectacular win, because the crowds were hugely festive. As the car slowly drove down the streets of the University, I felt like we were in a parade. People were waving and yelling, "Congratulations!" and it was just so incredibly ... unreal and other-worldly and amazing. I loved my flowers. I've always had a fondness for vintage things, so there were lots of hydrangeas, snow berries, and of course roses for a traditional touch. 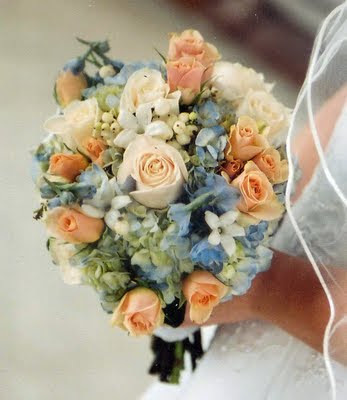 My something old was my grandmother's handkerchief wrapped around the stems of the bouquet. 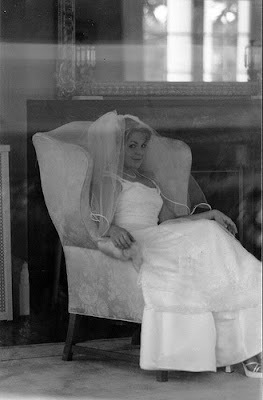 Preparing for the wedding is where I got my first inkling that I might possibly be creative. 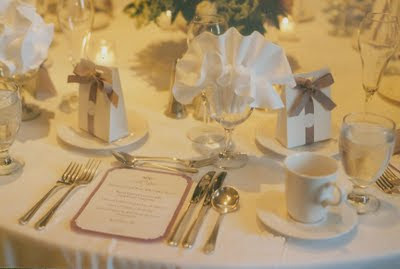 I made the place cards, the favors, the menus, and the programs. In fact, I enjoyed the entire process so much that I seriously considered becoming a wedding planner. 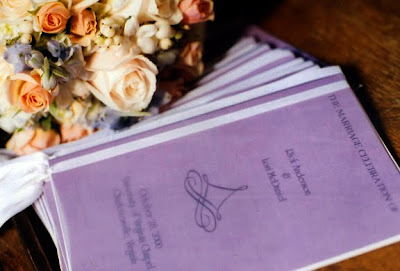 The programs were covered in purple vellum, bound with satin ribbon tied in pearls. The opening page began, "Once upon a time, two people met. And they had no idea that one day they would fall in love with each other." It continued in story book fashion. The music was traditional -- Handel's "Music for the Royal Fireworks" for the Seating of the Mothers, Pachelbel's "Canon in D" for the Prelude, and of course, Clarke's "Trumpet Voluntary" for the Processional. But we completely broke with tradition in the middle of the ceremony by having the University of Virginia's acapella group The Virginia Gentlemen sing. The VG's are the University's oldest acapella group, and their performances were some of the best memories I have of my grueling years of pre-med at UVA. They sang the BoDeans song "Good Things". Now, I tried for hours to get the song to embed into this blog post, and failed miserably. So I'm hoping that this link will work, because listening to these college students make music solely from their voices is worth a listen. The recessional was Mouret's "Le Rondeau", and Rick and I were ecstatic. 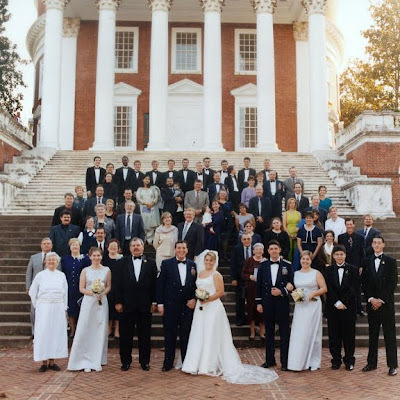 Once again, our photographer had a great idea that broke from tradition, and had all of our guests gather on the steps of Thomas Jefferson's famous Rotunda for a photo. It was a lovely memory of the day, and we sent them out as presents to our guests that Christmas. Now it was time for dinner and relaxation! Farmington Country Club has amazing food, and after drinks and hors d'oeuvres, everyone settled in for potato and leek soup with crispy bacon, baby green salad with raspberry vinaigrette, and either beef tenderloin and salmon, chicken and shrimp, or vegetarian lasagna. We opted for no head table, but kept it intimate, with small round tables, and since a lot of people came from points here and there, each place card opened to tell a little about how Rick and I met each person -- a bit of an ice-breaker and conversation starter for the guests. The cake! Or should I say, cakes! Everyone had their own -- coconut with chocolate and raspberries on the plate. Everything about the day was perfect. 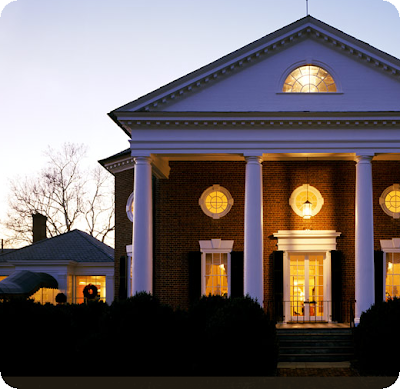 Around 10pm, we left the country club for Prospect Hill Plantation for our honeymoon. We were elated, exhausted, and still giddy. We took time throughout the weekend to write down every single tiny detail we could remember about our wedding day so we'd never forget -- so many things happen and fly by and become a blur at weddings and we didn't want to lose a single moment. "When the day shall come, that we do part, if my last words are not "I love you", you'll know it was because I did not have time". Sometimes it's hard to put into words the love you feel for someone you've spent so much time with. But I think, perhaps, he knows. First, how did we meet? Rick and I met while serving in the US Air Force, but hadn't been friends during the three years I spent in Korea. Don't get me wrong, we didn't dislike each other; he was just quite a few stripes higher in rank than I was and more or less ran the show, and I had a completely different place in the flight. But ten years later, via an email list that a colleague started (we are forever in his debt), we got back in touch. After a year of emailing back and forth, the rest, as they say, is history. By necessity, the wedding was going to be small -- about 50 people. All of our friends are scattered far and wide, in various states and countries, and only about four people actually lived in the town of the wedding. This was going to have to be a destination wedding. 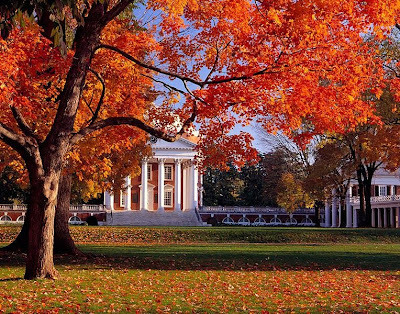 Charlottesville, VA, is special to me because I attended the University of Virginia and bought my first house in this lovely town. This was also the place Rick and I saw each other for the first time after the year of emails. The wedding was going to take place at the UVA Chapel, which was an amazing feat of skill in and of itself. 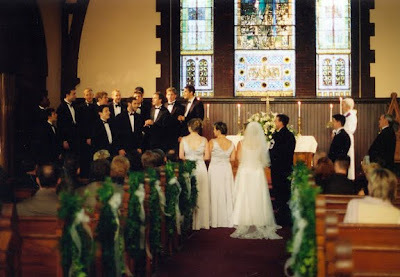 A lottery system is used to book the chapel for weddings, and you have to call the first working day of the month, one year before the wedding. Except for football season, which has its own set of rules, and our wedding fell during football season. (Is your head spinning yet?) 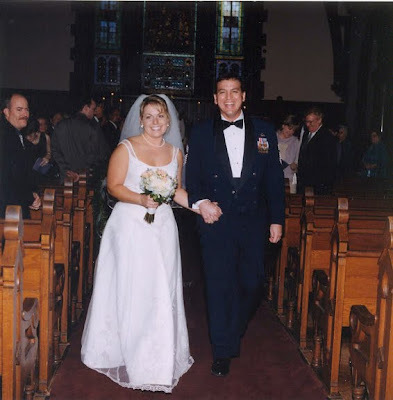 Thankfully, in 2000 they moved the lottery to a phone lottery, and I was given a specific time to call, rather than the way brides-to-be USED to grab a slot -- sleep outside the door of the office the day the lottery opened to get a good spot in line the one day you could register. There are always problems in planning weddings, though, aren't there? My particular problem was the day of my lottery, I had a presentation to give to a customer. My good friend Katie called in and pretended to be me, but when the time slot we wanted wasn't available, she was afraid to commit to another, so she faked a sneezing fit or something (I forget now) and raced in to interrupt my meeting to whisper in my ear for approval. That's a true friend. Katie, as a member of Farmington Country Club, also sponsored me so we could have our reception there. It's a beautiful, beautiful place with wonderful food and amazing grounds, and since Rick and I opted to see each other before the wedding, it was a terrific place to have that happen. 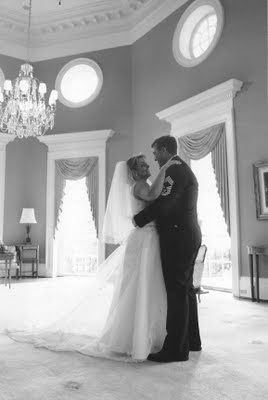 Also, since our wedding coincided with a home football game at UVA, there was zero parking on Grounds. We were providing transportation for our guests, having them all meet at the country club first so they could relax beforehand if they wanted. What a great change from the norm! The dress. Ah, the dress. I flew to St. Paul, MN to see my maid of honor, Kristin, for help choosing a dress. That was a rather humbling experience. 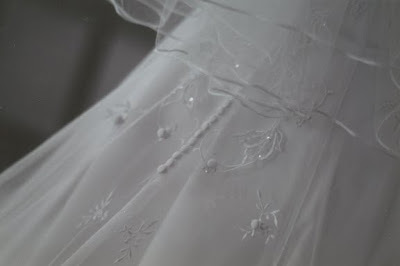 I've recently become an enormous fan of "Say Yes to the Dress" and if I had gone to Kleinfeld, I wouldn't have been sneered at for not being a size 2. The boutique we first went to was horribly rude, and I was in tears when I left. We ended up at, of all places, David's Bridal. I know that many people look at DB as the Walmart of bridal stores, but when Kristin and I walked in, the place was full of life and energy and laughter. I found a dress that I loved, in my size, so I could see it right then, not guessing at how it might look. I still wish I had known about Kleinfeld, though -- the trip to New York would have been worth it. And speaking again of "Say Yes to the Dress" and Kleinfeld, I loved the episode where they talked about having larger sizes and helping women make the most of their figures, no matter what that figure may be. 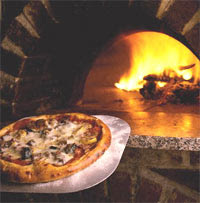 Our rehearsal dinner was a relaxed, fun affair, held at a brick oven pizzeria that made creative, utterly delicious concoctions. I purposely wanted this dinner to be casual because the wedding dinner was going to be a sumptuous extravaganza. One of the good things about having a small wedding was that we could splurge on food, and the country club wouldn't know a rubber chicken if it flew in the window and bit the chef on the bottom. The next day dawned utterly, completely perfect -- and I'm not just saying that. 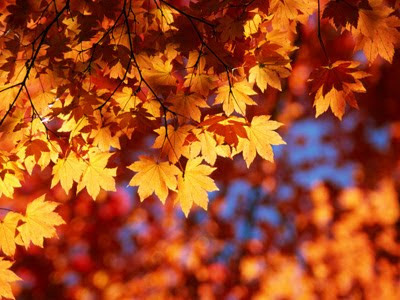 Being the end of October, we hit the peak of the leaves turning, but the day was balmy and clear and delightful. When I woke and looked out the window, seeing the beauty of the sun on the leaves and the green of the grass, the softness of the air and just the sheer magic of the day -- yes, I thought. It's a wonderful day to get married. Thus ends Part One. Part Two will begin tomorrow, and I hope you'll join me to read more! 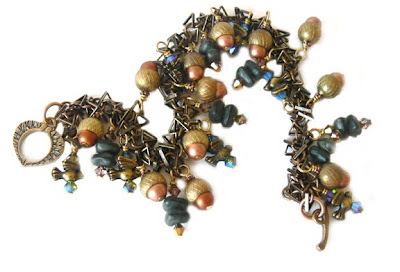 When Lori isn't reminiscing, she's creating jewelry. You can see it at www.lorianderson.net. I mentioned recently that I've dug into the deep recesses of my closet for the two or three pairs of "skinny" jeans that I'd doggedly held onto. Trouble is, that's ALL I have in the way of smaller clothes. Shirts are still the same size, for instance, and as a friend kindly put it, it looks like I'm wearing a box now. No wonder nobody can tell anything is changing under there. So today, after a trip for a new migraine medicine (big sigh, and sad shaking of head. Ow. But slow shaking of head.) I then ran a few errands in Annapolis, which included a stop at Barnes and Noble. If there' s a B&N within 45 miles, I'm there. 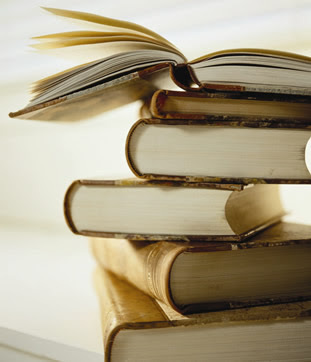 I just love, love, love my books. On the way out of the store, I passed a clothing boutique that I've always longed to enter -- South Moon Under. I've only ever ad mired the window displays because I never felt I was "cool enough", or, well, let's face it -- thin enough -- to walk in. In a world where a Size 00 exits, shopping has drastically changed. But what the heck, I thought. I owe it to myself to walk in. Yeah, I can do it. Sure, I'm not 20, but I'm not dead, and I make cool jewelry, so back off, man, if you roll their eyes at me! (This said STRICTLY in my head before I'd crossed the doorway. I'm way meeker than that in situations like this). 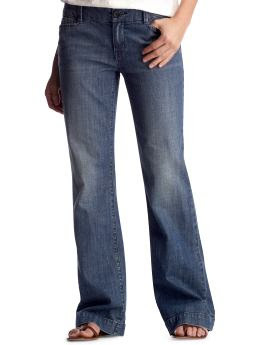 The girl was pleasant and told me about the sale on the jeans and I started looking around. And then I heard, "Is that Lori Anderson?" Oh Happy Day! One of my favorite people, and a remarkable woman who is key to organizing one of the most successful art and craft shows in the Annapolis area, The ALS Artisan Boutique (a fundraiser for Lou Gehrigs Disease) happened to be working in the store that day. A departure from my normal Eddie Bauer t-shirt, eh? I got the black pair, which unfortunately didn't photograph as well to show you all the cute ruffles, so I had to show you the gray/taupe version. As much as I love all things historically romantic, it's not too surprising that I love these. What IS surprising is that I can walk in the bad boys. These will have to be worn only for Looking Pretty and Making a Statement. Not for play dates or grocery shopping. Unless I commandeer one of those electric carts or something. Well. Let's just say if my feet were in 20-year old shape and I didn't have to wear Birkenstocks and Danskos as a rule, these would probably be hanging out in my closet, too. and absolutely will be wearing them 99% of the time -- it's nice to be branching out. Just like I plan to branch out in my jewelry next year, it sometimes takes meeting that right person at the right time to nudge you in the proper direction. So what will you be wearing this fall? Where should I be shopping online? 1000 ring tones. 53 different ring tone alerts. All for your listening pleasure, thanks to Vodafone. 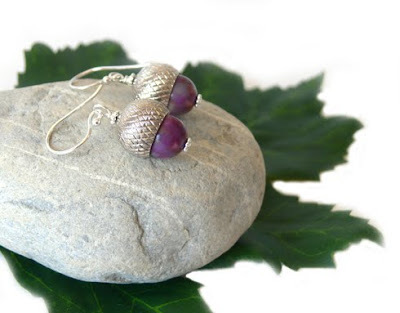 I'm loving acorn-inspired jewelry this year, and at my last show in Northern Virginia, it was a great hit. The bracelet below sold, but I couldn't resist sharing it, because I really was pleased with how it turned out. This piece was actually under the table in excess inventory (of which, at the end of the show, there was NONE), and when a customer brought up a pair of the pearl acorn earrings to buy, I had to crawl under the table to show this bracelet to her. She snagged it immediately. I'm just really glad I had the forethought to snap a photo first! More jewelry will get to the web site as I recuperate from being wiped out of inventory (seriously -- the cupboards are BARE) and as I recuperate from various ouchies and ick. So stay tuned to www.lorianderson.net, particularly the New Designs page. Things will start showing up on an almost daily basis very soon! Easy Wire 2009 -- A Give-Away! 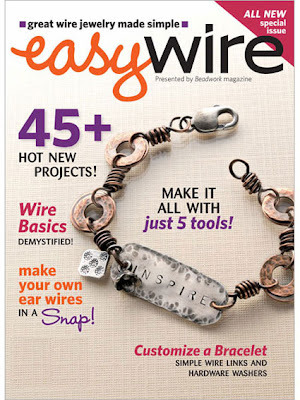 My friend Cindy Wimmer of Sweet Bead Studio is celebrating the appearance of her wire jewelry tutorials in the Step By Step Wire 2009 magazine by having a give-away on her blog. 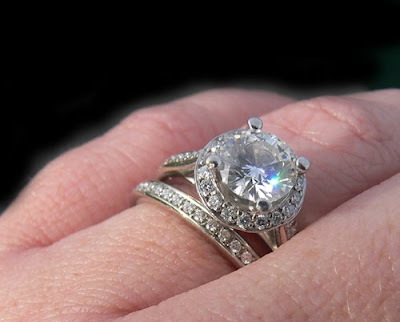 I love Cindy's blog, and have enjoyed every single minute we've had sharing experiences with our kids and jewelry design and business development in general. You can join in the fun by visiting her blog at http://www.sweetbeadstudio.com/ -- be sure to click into her store from her blog. I'm the proud owner of a pair of her metal earrings! The Holiday Shop is Now Open! I had a big show this past weekend, promptly got a bad cold on Monday, worked like crazy for two days to get all my custom orders out in the mail, and then had my second spinal tap yesterday. If you've been a regular reader of my blog, you'll know that three or four months ago I had a pretty bad experience with one (I won't link it, but you can search back -- I apparently scared some people last time!). I'm happy to say that with the aid of an MRI and lots of prayers and white light from friends, yesterday was NOTHING like the Oh-So-Memorable experience of months past! So I should be headache-free for a while now, and am recovering nicely sitting on Rick's recliner with the laptop. 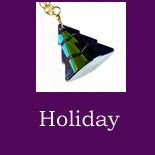 To that end, I had the chance to open up the Holiday Store on my web site, Lori Anderson Designs. So far there are only a few things on it -- three styles of Christmas trees and a cute frog pendant -- but expect to see some pink snowmen, penguins with hand-crocheted scarves, funky mismatched trees, and a lot of other things ranging from classic to whimsical. Have a special request? Just shoot it my way! 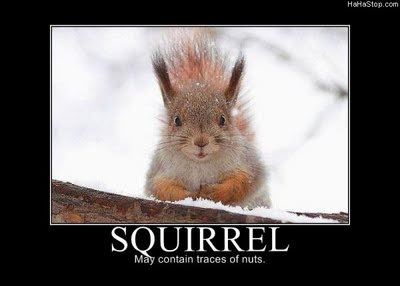 You can reach the Holiday Gallery from the main page, www.lorianderson.net -- check back often! And thanks for looking! I'm remiss on blog posts because I had a blow-out of a craft show -- blow-out in the amazing sense. So amazing that I have to cancel my appearance at a the Virginia Beach Thanksgiving Weekend show. There is just no way that I would be able to get through being sick (I am trying to recover from a cold? flu? ), get another spinal tap (today), create enough inventory for a fund-raiser that I'm heavily invested in (The ALS Artisan Boutique in Annapolis, MD), and then a 3-day show in VA Beach. I've never, ever, sold so many things that all of my inventory was on the table tops, with nothing left underneath, and what was ON the table tops was sparse. Humbling, and amazing. So once I get over this cold/flu/ick, I'll be working again, feverishly. But hopefully not feverish in the true sense. 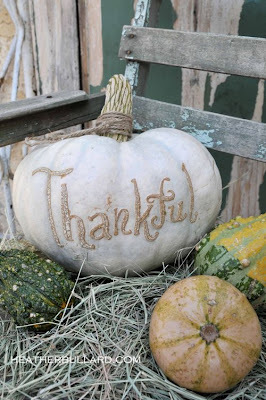 In the meantime, I'll leave you to wander through another lovely pumpkin patch, this time thanks to another of my favorite bloggers, Shabby Scraps. 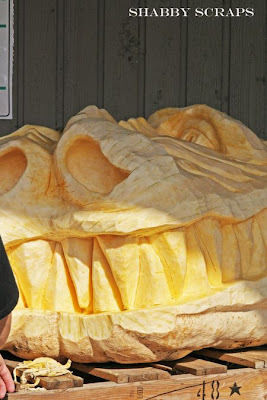 I love her blog because I love all things old and interesting, but her post about her husband's growing GIANT pumpkins really caught my eye -- and then, what they DO with them! Click here to read, but be sure to explore her entire blog! 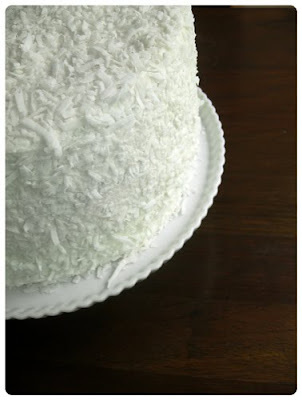 Head over to Heather Bullard's amazingly beautiful blog and take a peek around. I particularly love her recent post, "Glorious Pumpkins". I always plan on doing something clever and creative for the fall and always, without fail, run out of time. So I content myself with looking through my favorite blogs and being amazed at what I find. Click here to see more of the pumpkins! To see what Lori's doing instead of finding the perfect pumpkin, visit www.lorianderson.net. Finally! 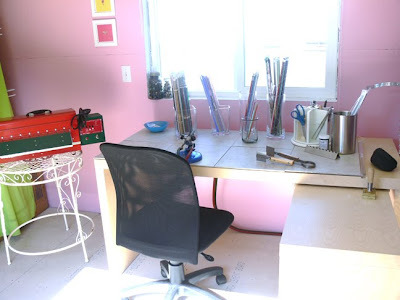 The lampwork studio is done! Want to take a tour? Then head on over to "Watch Me Create" and take a look around. 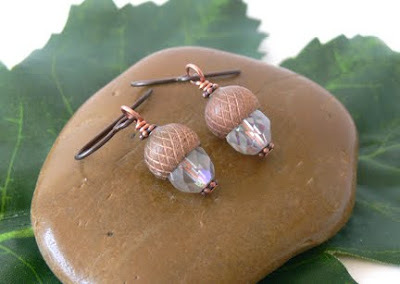 To see what Lori does with glass beads, visit www.lorianderson.net. 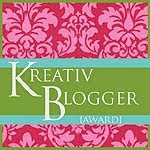 I just received the Kreative Blogger award/meme from Dustjacket Attic, and I'm supposed to share seven things with you that you don't already know about me, and then honor seven other bloggers with the award. I know that some of my readers don't like to get these memes and it would be hard for me to pick just who to give it to (I read a lot of awesome blogs!) so I'll hope that a lot of you will snag the award and give me something cool to read about you next time I visit your little spot in cyberspace. 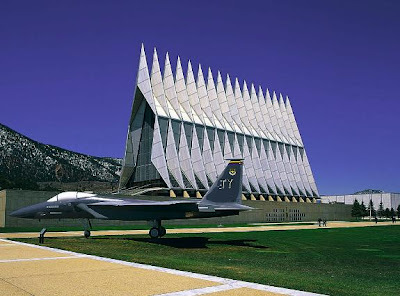 1) While enlisted in the Air Force, I considered applying to the Air Force Academy, but decided against it because I realized I loved my job as a linguist, and didn't want to be an officer WATCHING people do their jobs as a linguist. 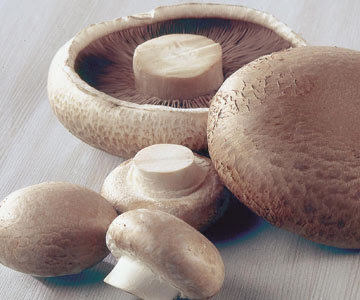 2) I can't stand mushrooms. 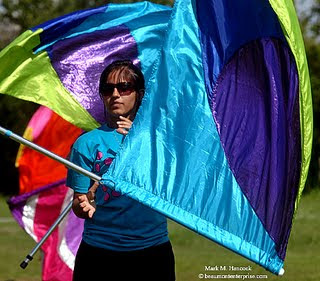 3) I was the Color Guard Captain in my high school marching band. That meant I flipped a flag around in fancy formations. Geeky, I guess, but I sure did love it. 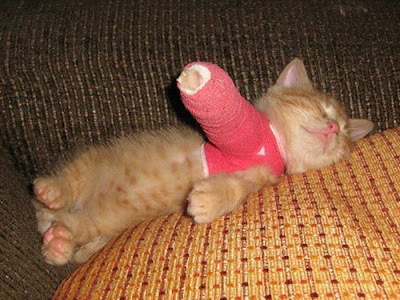 4) I've broken a leg three times and an arm twice. I broke my first leg when I was nine months old and another leg while in Basic Training. The third one was a few years ago, and I put Swarovski crystals all over it. 5) I lived in South America for three months on a missionary base when I was 11. 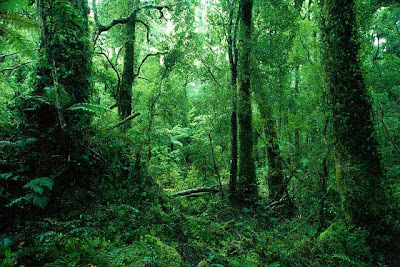 It was literally out in the middle of the rain forest of Columbia, and it was one of the coolest experiences of my life. 6) I learned to read when I was three. And now, to me heaven is a huge library. 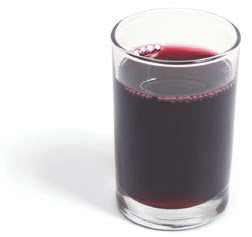 7) I've never drunk grape juice since Kindergarten after an, um, unfortunate incident with it. Ditto orange juice. 8) I appreciate each and every one of you who take the time to read my blog, and you have no idea how happy it makes me when you post a comment. It warms my heart and makes my day. I'm sitting here writing this with a huge, stupid grin on my face. I'm wearing my skinny jeans. Well.... not exactly skinny jeans. But an entire size down, thankyouverymuch. Let me explain why this matters. Like many out there, I've had a love-hate relationship with my weight for years. In the past ten years, it's mostly been hate. To be honest, it's been mostly loathing, topped with downright hatred. There are a million and one reasons for this pound and that pound coming and sitting down for a chat and staying for dinner and then bringing their friends for a sleepover, but I finally got sick of hearing myself bellyache about it (ha ha -- bellyache. Heh.) and decided to DO SOMETHING. ANYWAY. Fast forward to last night. I was frustrated because I've lost 25 pounds since December but no one is seeing it. My friend said it's because it's coming off slowly (which is good, no crash diets) and I realized, after taking off my pants last night without having to unzip them, that I'm wearing the same clothes I wore 25 pounds ago. Even with a belt, who's going to notice? So today I dared to venture to that region of the closet known as the Wishing Well. The dark recess where women store their Skinny Clothes -- the clothes we promise we ARE going to fit into (we are we are we ARE dangit). And I shut my eyes and reached for those jeans. And they fit. Without holding my breath. Without hopping around yanking on the zipper. Smooth as silk, there they went. And I'm sitting here cross-legged on a chair comfortable as I can be writing about it. I don't like to write about my weight much because I WAS thin and taught aerobics and never thought it would come to this, and because weight gain is such a sensitive subject. There are some out there who can be cruel about it. But I think there's a lot of people out there, men and women alike, who need someone to rejoice with them over the milestones, and it doesn't matter if we've met or not. Today, skinny jeans are way, way better than ice cream ever was. 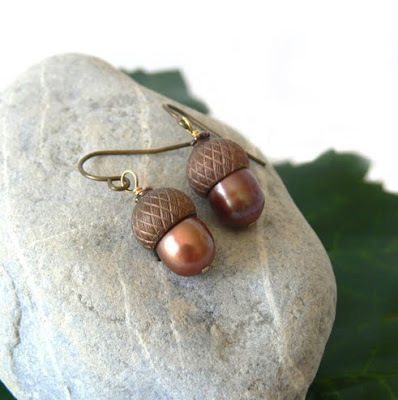 I thought this would be the perfect segue into my newest addition to Lori Anderson Designs -- acorn earrings! I had fun with these, and just added them to the web site today. 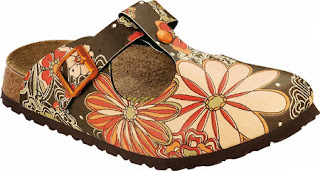 At just 12.00 a pair, they're an inexpensive way to welcome autumn! Click on each picture to take you directly to each pair. You can see more of Lori Anderson Designs handmade jewelry at www.lorianderson.net. I have fallen in love with the blog DustJacket Attic. Her posts contain amazing imagery from photo shoots from tons of fashion magazines, such as Vogue magazines from various countries (a recent one was from Vogue Korea, a magazine I used to get when I lived there for three years) and now that I design jewelry, I'm finding that I look at these photographs in an entirely new way. Do yourself a favor, and visit her blog, add yourself to her many followers, and give yourself a daily eye-candy treat. Now I'm off to visit the shoes.